Enjoy a few laughs for a good cause. 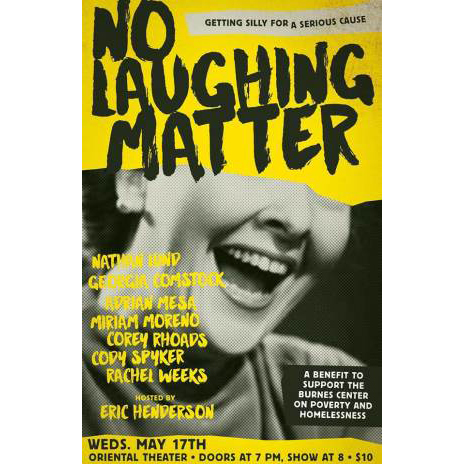 Please join us on Wednesday, May 17 at The Oriental Theater for “No Laughing Matter.” The comedy show for a cause brings together a stellar lineup of Denver favorites including: Nathan Lund, Rachel Weeks, Corey Rhoads, Cody Spyker, Adrian Mesa, Miriam Moreno and Georgia Rae. Proceeds from all ticket sales will benefit the Burnes Center on Poverty and Homelessness, which provides assistance in research, policy analysis, and program evaluation and improvement. Through the work of the Institute, people who are homeless or at risk of homelessness are empowered to live full lives of their choosing. Good Chemistry’s Vice President of Public Affairs, Meg Collins, serves on the Burnes Center Board of Directors and hopes members of the Good Chemistry Community will support this important cause. Doors open at 7pm and the show will begin at 8pm. Tickets to the event can be purchased online or at the door. To learn more The Burnes Center and their mission, click here.